Posted 20th June 2012 by Myfanwy in News. FixMyTransport has been shortlisted for a Nominet Award in Online Public Services & Information. We don’t think they’re called Nommies, but we’re very tempted to refer to them that way. Nominet are the not-for-profit organisation responsible for the smooth and secure running of the .uk infrastructure. They maintain a directory of domain names ending in.uk, and run the technology which locates the computer hosting the website or email address you are looking for. Their annual awards aim to showcase UK projects which help make the internet a more secure, open, accessible and diverse experience for all. Our category is specifically for websites which are improving two-way communication, and improving local services for citizens, which pretty much sums up FixMyTransport, we think. The winners will be announced at an Awards Ceremony on Thursday 5 July. Wish us luck! If you’d like to see who else is in the running, you can browse all the shortlisted projects here. Posted 7th June 2012 by paulhollinghurst in Advice. Cycles and trains should be perfect companions for car free travel but there can be problems as shown by a number of FixMyTransport campaigns. 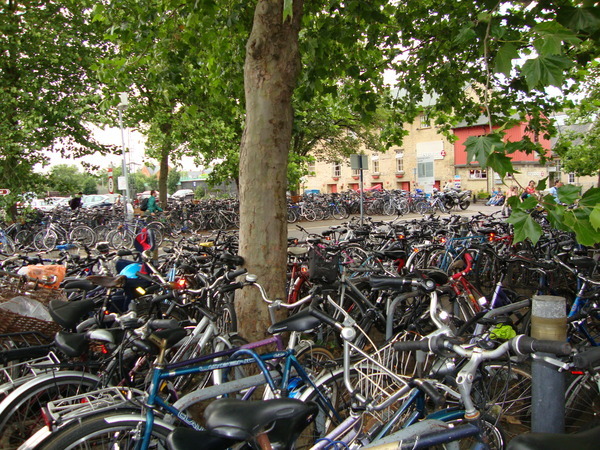 Cycle parking at stations is often inadequate as shown in the strongly supported campaign for more cycle parking at Cambridge Station. The good news for Cambridge is that is was one of 68 places to receive recent funding to improve cycle facilities covering a mixture of cycle parking and cycle hire schemes. Cycle parking is something which will require continued campaigning at local and national level, and this is where FixMyTransport can be valuable for gathering support and exchanging ideas. Passengers can also find taking their cycles on trains to be a frustrating experience due to complex rules which vary from company to company and the need to limit the number of cycles on many services. Extra carriages are very costly so it is never going to be possible to cater for an unrestricted number of cycles. For example FixMyTransport users report problems booking cycles on trains and rules which sometimes appear to be too restrictive. Before taking a cycle on a train it is important to check the rules. National Rail Enquiries has a page of information for cyclists, including a link under “More information” to download the National Rail Cycling by Train leaflet. In general folding cycles are always allowed on trains, whereas non-folding cycles are often restricted to a limited number per train, can require pre-booking, or can be banned completely.